It is easy to spot an fake bag, but how about jewelry? 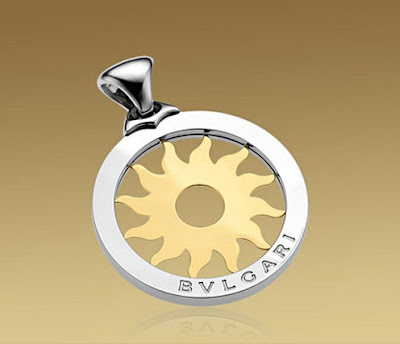 Look at this fake Bvlgari TONDO "Sun" pendant. The story behind these photos is a little frustrating so, I won't share it anymore. What's important is that I proved its inauthenticity before anyone could purchase it through the help of some salesperson at Bvlgari Greenbelt. A fake Bvlgari TONDO "Sun" big pendant. 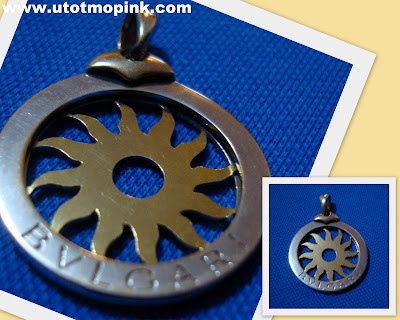 This is the authentic TONDO "Sun" big pendant. 1.70" (4.30cm) diameter. Made from 18 karat yellow gold and steel. Available at BVLGARI.COM for $1,550. 1. Check the logo. Noticed any difference in size of the letters? 2. Inspect the material used. Does it look like real gold? Not tarnished? 3. Check the size and weight of the jewelry. It might be smaller or lighter. 4. Packaging. Does it come with a box or papers to verify its authenticity? 5. Ask for the price. Fake ones are usually cheaper. NOTE: This post was originally published in my old blog, utotmopink.com, dated May 22, 2010.